Milestones are a way of marking out key stages in a project. They help to measure the “distance to travel” in a project. Typically this would be the completion of a key deliverable, for example finishing a proposal, or a completing a high level review meeting. These significant events usually require a set of tasks to achieve – ie a Task List (read more). This is why Dooster’s milestones can be made up of one or several Task Lists. Open a project and access the Milestone screen. (Use the tab at the top of the page in a project – see diagram below). Then: Click on the “Create New Milestone” button. In the resulting pop-up use the “Related to task list” drop down to select one or several Task Lists that you want to belong to the milestone. Create a Due Date for the milestone and save it. 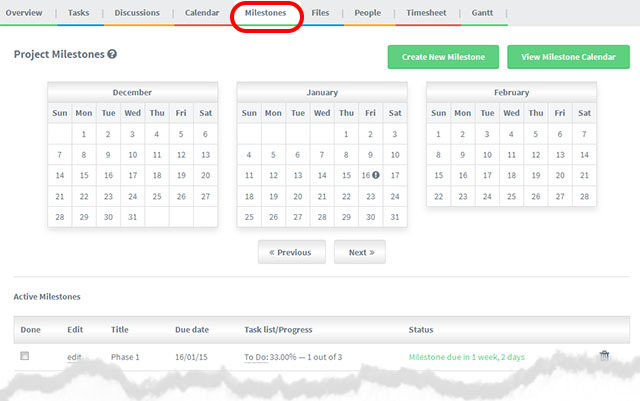 The milestones are listed in each project in the Milestone screen (Use the tab at the top of the page in a project). A progress bar shows you how things are progressing with each associated Task List. You can see all your Milestones in one place by clicking on the “Milestones” button (on the side navigation). b) Plus: Milestones comprise one or several tasks lists. You can drill down into the task lists from the milestone. It wouldn’t make sense if for example the Milestone says ” 7 out of 10 done” yet the member can only view 3 tasks that they have permissions to see.